Ladies single or not, this February 13th celebrate your love of your lady friends by hosting your own Galentine's Day celebration. Galentine's Day which was introduced by NBC's Parks and Recreation is about ladies celebrating ladies and honors friendship between women. 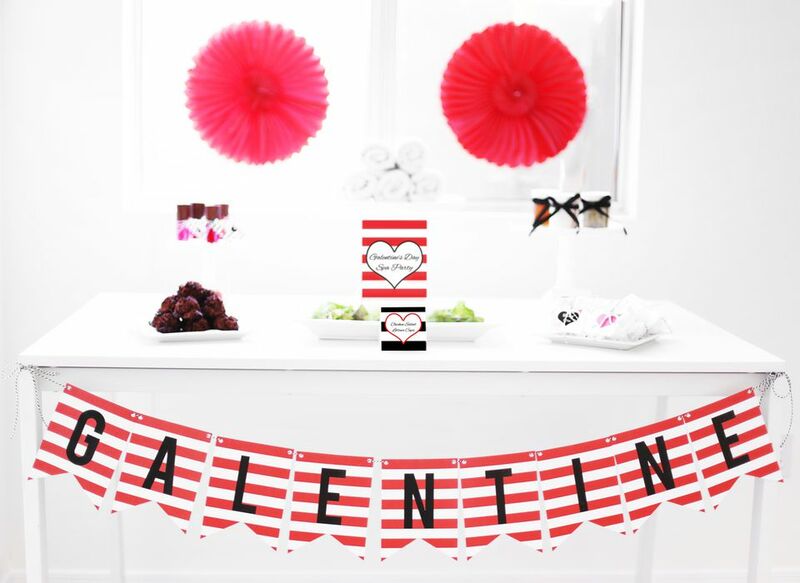 To decorate your Galentine's Day party make your own red and white Galentine banner to hang up in your home. Send one of these two cute DIY Galentine's Day card to all your close female friends on Feburary 13th with this free printable card that you can fold and cut out. Surprise your female best friends at your Galentine's Day party with their own personalized gold leather heart coaster with their name written with a pale pink marker for a cute party favor that guests can take home with them. Quickly assemble this amazing heart photo backdrop perfect for taking silly photos with your female friends this Galentine's Day or Valentine's Day by building a quick frame out of inexpensive or scrap lumber and chicken wire, and use a large package of red napkins to stick into the chicken wire to form a heart. Make this hilarious fries before guys French Fries box which you can fill either with actual French Fries or long sticks of shortbread cookies cut to look like French Fries for all the women who attend your Galentine's Day party. Grab a pack of heart paper plates to use for your Galentine's Day brunch this year, and stick the extra paper plates temporarily on the wall for a creative way to decorate before all your gals come over for a mimosas and waffles party. If you truly want to suprise your best friend this Galentine's Day give them a necklace which you fasten around this shine printable packaging with beautiful script lettering that says "you are a gem" or "shine bright". Inflate a bunch of regular white balloons and decorate them with hearts cut out of red tissue paper to create a balloon bouquette perfect to give to a friend this Galentine's Day. Most women dream about receiving flowers for Valentine's Day, so make sure none of your single or friends in a relationship are left out by giving them all mini bouquets of flowers that you can easily assemble by dividing up a large bunch of flowers. Decorate blank travel mugs with vinyl stickers that you make with your Cricut of kiss prints or a the cheeky message of "this is why I'm hot" for the perfect gift to give to each member of your girl squad.